We'll be featuring love songs from old Hollywood films throughout the Valentine's season. 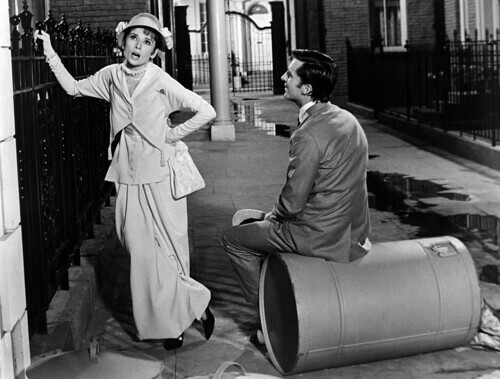 Today's selection is On the Street Where You Live from My Fair Lady (1964). On the Street Where You Live is the most popular song from the landmark musical My Fair Lady, but the songwriters never cared for the tune and almost removed it from the show. In 1956, lyricist Alan Jay Lerner and composer Frederick Loewe created a musical based on George Bernard Shaw's 1912 play, Pygmalion. The musical tells the story of Cockney flower girl Eliza Doolittle, who is transformed into a lady by phonetics professor Henry Higgins. Lerner and Loewe created a unique score for My Fair Lady that is both innovative and beautiful; in fact, My Fair Lady has often been called the perfect musical. 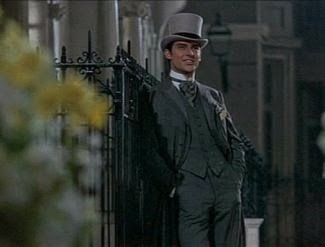 Jeremy Brett singing On the Street Where You Live in My Fair Lady (1964). The cast of My Fair Lady shaped many of Lerner and Loewe's songs. Julie Andrews, then a relative unknown, was hired to play Eliza. Lerner composed the delightful waltz, I Could Have Danced All Night, specifically to showcase Andrews' soaring soprano. Rex Harrison's portrayal of Professor Higgins was legendary, but the notoriously difficult actor was terrified of singing on stage. To compensate for Harrison's shortcomings, Lerner and Loewe wrote several witty numbers (Why Can't the English, I'm an Ordinary Man), which Harrison could "talk-sing." Audrey Hepburn and Jeremy Brett in a publicity still for My Fair Lady (1964). Next to those innovations, On the Street Where You Live seemed tame by comparison. The number occurs at the end of the first act and features Eliza's high society suitor, Freddy Eynsford-Hill, pining away outside Higgins' front door. Freddy was played by John Michael King in the original Broadway cast (his version is below). Jeremy Brett played Freddy in the film (his singing voice was dubbed by Bill Shirley). Loewe never liked On the Street Where You Live and tried to remove it from the show -- he didn't think it was as good as the rest of the numbers -- but in the end the lovely tune stayed in My Fair Lady. My Fair Lady was the toast of Broadway in 1957, and On the Street Where You Live was the biggest hit from the show. It seemed that everyone who was a pop music artist in the late fifties and early sixties recorded their own version, including Eddie Fisher, the Lawrence Welk Orchestra and Andy Williams. The most popular version was by Vic Damone, which reached No. 4 on the Billboard charts (clip below). Decades later, On the Street Where You Live is still part of pop culture. Damone's version was used on the first episode of the popular AMC series, Mad Men. The timeless tune is even being used to sell Big Macs. In 2011, McDonalds aired a TV ad in the United Kingdom that featured a burger-crazed hipster singing On the Street Where You Live while rushing to his nearest Mickey D's (clip below).